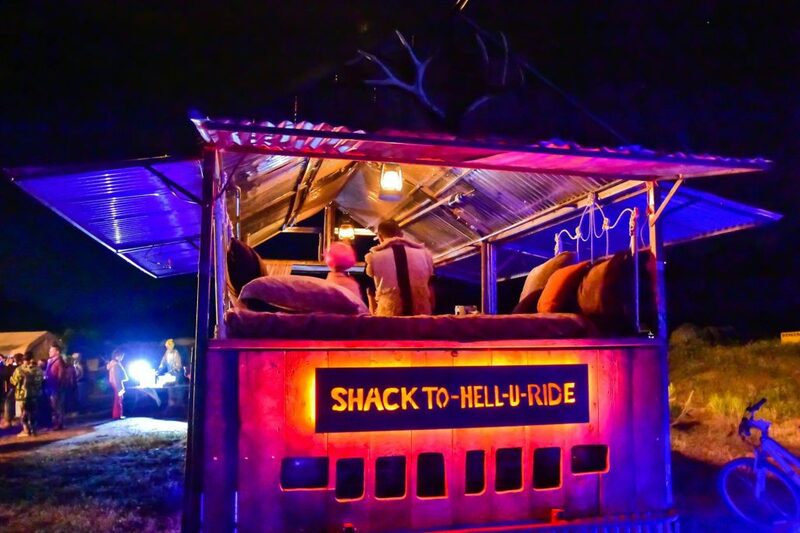 Telluride Fire Festival is trying to bring the art car “Shack To-Hell-U-Ride” to Burning Man to serve as public transportation for the community. The Shack is an artistic interpretation of a turn-of-the-19th-century miner’s tiny home that is mobile. The most unique and dynamic special effect on this one-of-a-kind Mutant Vehicle is that the roof is on fire (literally!). The “burning” shack “floats” along The Playa and looks as if it is burning…but we promise it’s safe…and yes, we carry fire extinguishers. Built on the chassis of a chopped-down 1989 Ford Transporter van and designed/built by renowned BRC artist Jamie Vaida (Oakland, CA) and Alvin Sessions (Grand Junction, CO), this mutant vehicle was safely modified to have a dynamically flaming roof made of non-combustible sheet metal. The Shack is mostly made out of found objects—wood and artifacts from the mining era in Telluride, CO. The interior space resembles a miners cabin complete with a wrought iron bed, a functioning vintage parlor wood stove, and a 1920s icebox for refreshing beverages. The Mutant Vehicle can transport up to 15 people at a time and features a an 8-panel, solar-powered, sound system (added last year) to suit the mood day and night. We have grown her into a demonstration of responsible and renewable energy powered consumption. With your help—she is a bit of the old and the new, inspiring restoration and repurposed rehabilitation versus demolition and abandonment of the old. We VALUE reuse infinitely. Therefore, much of our art car has been salvaged, found, rescued, and discovered in dumpsters. To transport the art car safely, we do need something new: a goose-neck trailer rated for a 10,000-lb load. For the last two years, we have borrowed trailers to transport the Shack the 2,000-miles to Black Rock City and back. Both times, it was indeed trial-by-fire, of sorts (pun intended), and we had significant breakdowns, including multiple blown tires and a broken axle. Our 3-day journeys each way were not easy (better described as stressful), and we oft describe this project as a labor of love and lunacy. 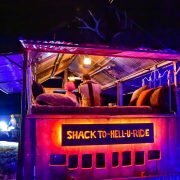 If we don’t purchase a trailer suited for and dedicated to the Shack, we will likely not be able to bring the art car. With your help, this year we are hoping to buy a new trailer! Click here to support this project! Thank you! Fire Performances & Fire Installations MTNtown Magazine Sponsors Jan. Event!